This post has been sponsored by Nielsen-Massey. All opinions expressed are my own. 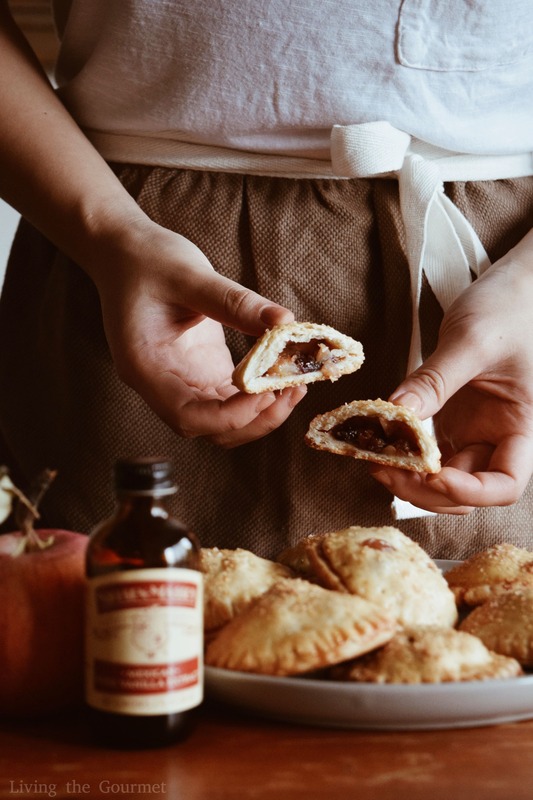 Warm spices and flaky pie dough make these Apple Hand Pies a seasonal must for the holidays! While we’re on the subject of ‘individual enjoyment,’ you may be surprised to learn that it wasn’t until a few years ago that I had ever enjoyed an ‘individual pizza.’ I was in city to cover the release of a new book from Martha Stewart, and after the event I needed to unwind a little and so I popped into this ‘hole in the wall’ eatery, and I don’t why but I ordered the their individual pizza. What arrived wasn’t that far off from a ‘standard’ pizza, perhaps lacking a few inches in total diameter but otherwise pretty standard. “Well, they’re calling it individual, and I’m going to treat it like an individual pizza,” and the whole thing vanished rather quickly – a decision I was soon to regret, but nevertheless enjoyed. Why am I talking about this? 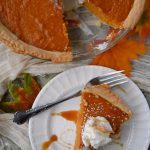 For the simple reason that there’s a certain sort of ‘devious’ enjoyment to having something ‘all to yourself.’ Imagine, for example, a chilly fall morning, and you’ve got your coffee and…pie, you want pie. Yes, you want a combination of cinnamon, sugar, and baked apples congealed within a sweetened crust crystallized with a glaze of sugar, but you don’t want the hassle of slicing or sharing, sharing? Sharing, what’s that? I’ll tell you right now what that is, it is something you don’t want to do when it comes to pie. No, you want the aforementioned apple-y goodness entirely unto yourself, and with today’s recipe that’s precisely what it will be. 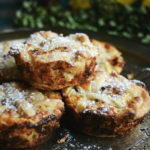 Naturally, however, today’s pies are bite-sized, individual indulgences. Just large enough to be substantial, but just small enough to dunk in that aforementioned coffee. Pile them up on a plate, and they’re a supremely ‘autumn looking’ centerpiece with all of the flavors of the season, with just enough sweetness to be a ‘dessert,’ and just enough ‘warmth’ from the cinnamon and brown sugar flavors to keep you coming back for more. To start things off, we being by prepping the crust, which is a combination of flour, sugar, salt, and butter. Process that in a food processor until the mixture becomes crumb-like, add the cold water one tablespoon at a time until the dough ‘pulls’ together. Once that has been achieved, chill the resulting dough until it is ready to use. Up next is the filling. To start things off, we begin by peeling and dicing three apples. You’re going to want to dice the apples a fair being smaller than you are accustomed to with standard apple pie, think chunks or cubes rather than slices. 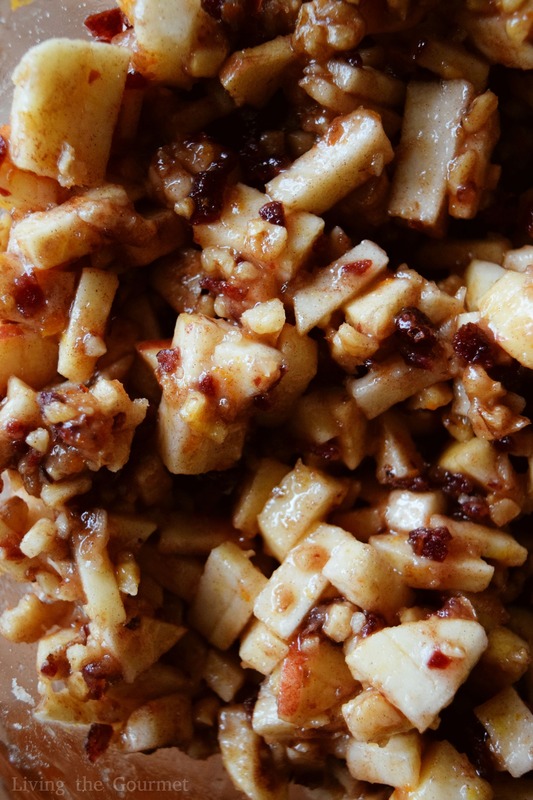 Then, in a bowl, combine the apples with fresh lemon zest, sugar, cinnamon, coarsely chopped walnuts, your choice of cranberries or raisins, and vanilla. 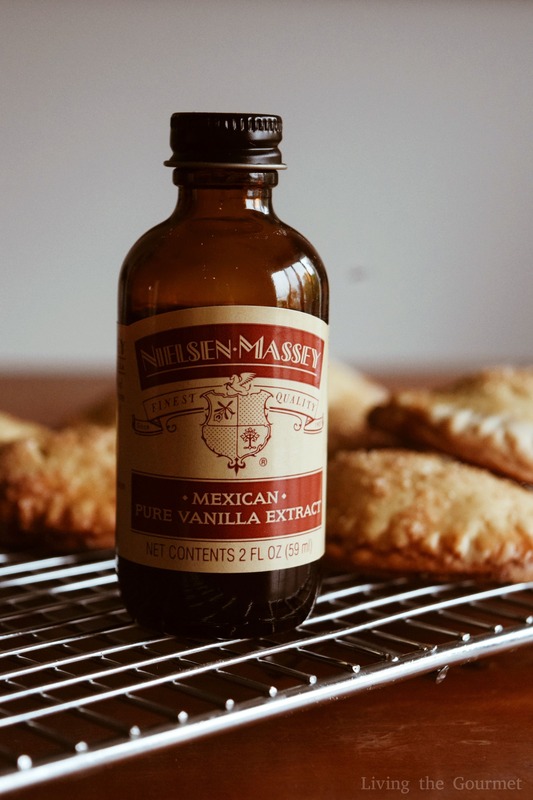 For today’s recipe, as in all the recipes that I prepare that call for extract, I’m using Nielsen-Massey Mexican Pure Vanilla Extract, made from premium, hand-selected beans cultivated in Mexico, the original birthplace of the vanilla plant. Nielsen Massey is simply the gold standard in extracts in terms of purity, flavor, and reliability in quality. The Mexican vanilla flavor has a deep, creamy, spicy-sweet character, similar to clove or nutmeg which is why it pairs perfectly with today’s recipe. 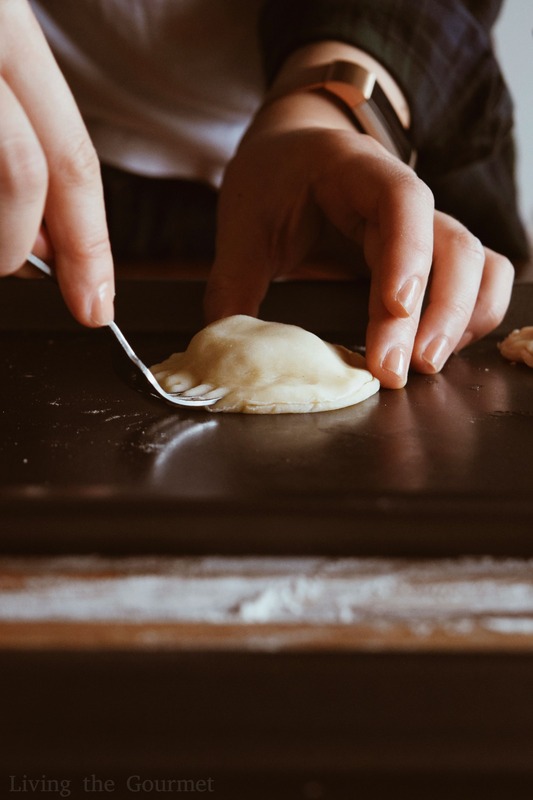 Once that’s done, roll out the dough from before to about a quarter of an inch in thickness, and then simply cut out the desired size for your pies as shown below. For convenience, I simply used an upside jar to portion it out. Then portion out the apple mixture into the center of the dough slices, and cover the mixture with another slice of dough, and press the edges closed with a fork. Then brush the top of each resulting piece with an egg wash, sprinkle with sugar, and just like that you’ve got your individual apple pies. Combine the flour, sugar, salt and butter in a food processor and process until the mixture becomes crumb-like. Add the cold water one tbs. at a time until the dough pulls together. Chill until ready to use. Combine all of the ingredients for the filling in a bowl and toss. Roll out the dough to ¼ inch thickness and using a desired size jar cut out the dough. Using a tsp. place, the apple mixture in the center of half of the dough cut-outs. 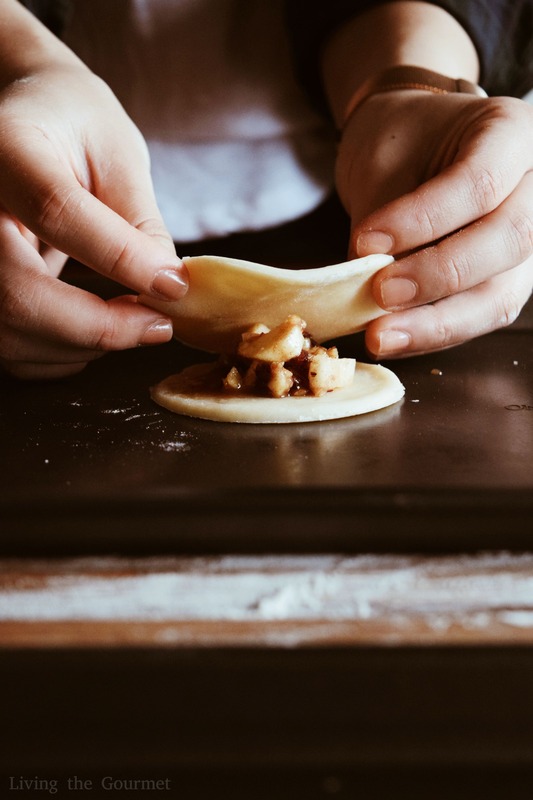 Use the remaining half of the dough cut-outs to fit on top of the dough with the filling and press into place along the edges with a fork. Brush the top of each hand pie with the egg wash and sprinkle with sugar. Bake 20 – 25 minutes or until lightly golden. Aside from vanilla extract, Nielsen-Massey also offers a range of flavors, the ones I use most being their lemon extract and almond extract – though I’ve also had occasion to sample their chocolate extract, which is simply superb. For more information on Nielsen-Massey, or to order, check out their website! Those look so good! They are the perfect thing for fall. They have the flavor, they have the look, and they have all the seasonal feels. 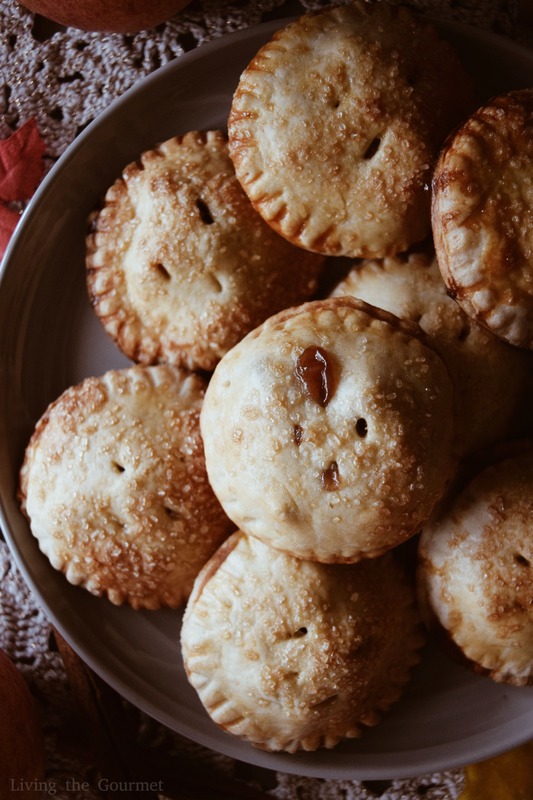 I am pretty sure by the looks of these handpies they are addicting and I would be able to eat at least a dozen what I love is that flaky pastry crust and fall delicious apple filling! Look wonderful, I love all with apples, always are delicious!! 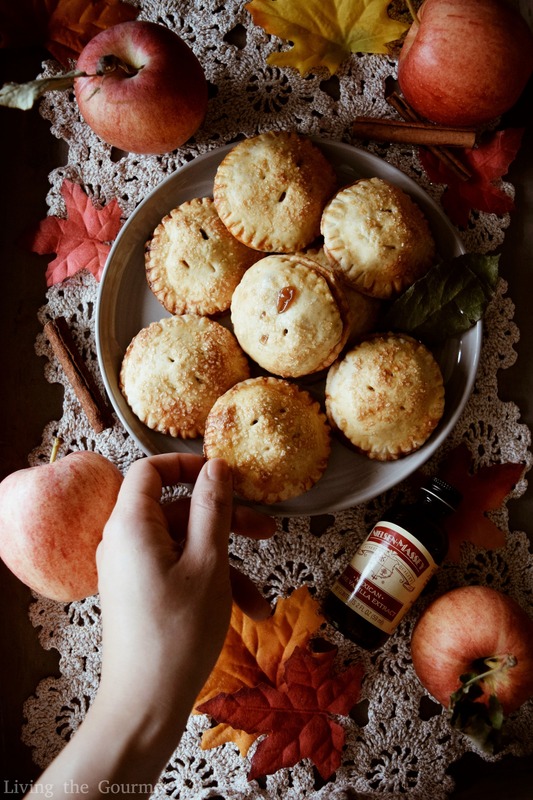 These apple pies look yummy and they are healthy too. It is really worth a try. Thank you for sharing this as I really do love this sweet treat that I will def try soon as well. I hate sharing! If I ask you once and you say no, I'm not asking a second time lol. OAN I'm not a fan of apples but this looks so good and I would have this dessert with no one around so I can indulge in peace. They look so inviting and you made it seem really simple to make too. Wow, seeing those photos makes my mouth watering. It looks so delicious and looks so easy to prepare. I will try to make this and I am sure my kids would love this. Love that they are individually portioned this is great for portion control. Perfect for the fall season. These hand pies look so good. Perfect for apple season, and they would make a great dessert for next weekend...it will be Thanksgiving in Canada. I love desserts from apples. And this recipe really impresses me! Looks incredibly tasty. It's a great idea to taste it with a cup of tea. This looks delicious! I loved your photos too! What a great fall dessert. I love making apple hand pies this time of the year. SO simple and easy. And perfect for the season. Great to give as seasonal treats too. I am a sucker for apple pie anything...and pie crust....and all things mini! These are a win all around - yum! 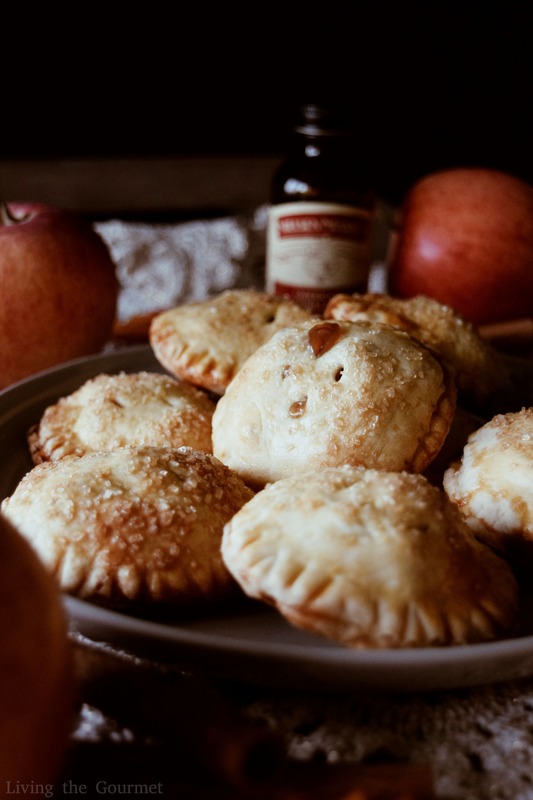 These apple hand pies look terrific, and I bet they smelled great too. I'd love to try one right now with a tall glass of cold milk. These little pies just speaks fall. I am going to make these for thanksgiving and the next dinner party. They look soo good and cute! I kooove apple pies especially with coffe. This recipe is delicious and easy to do. 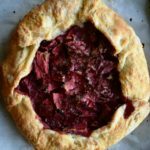 These hand pies look fabulous! They are so perfect for a snack, for brunch or for a lunch box! These seriously look so good! I love that you've added cranberries, walnuts, and orange to this. 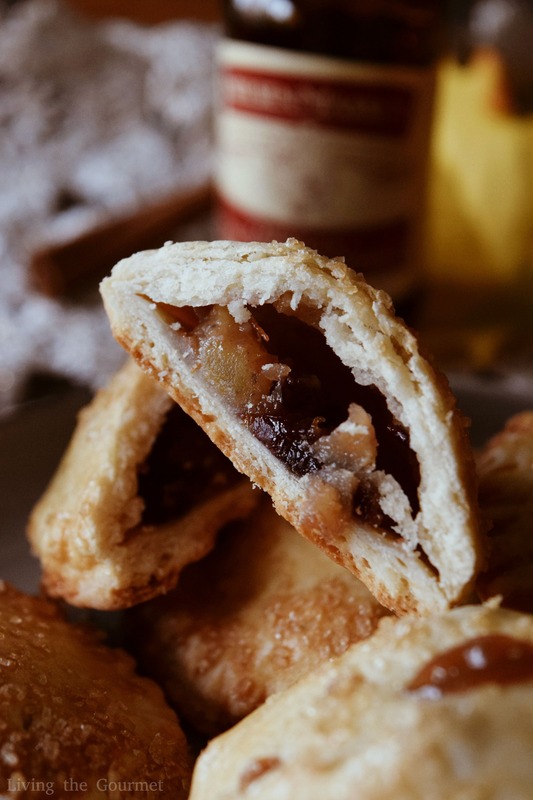 What a wonderful hand pie recipe - I would gobble several up in one sitting! 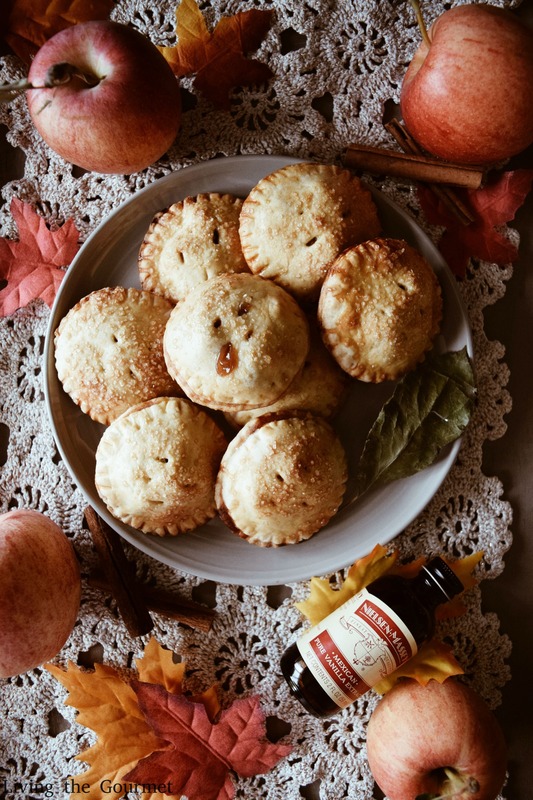 Those Apple Hand Pies are adorable!! 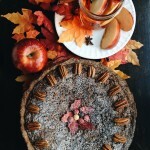 What a great dessert for the Fall season. They would be great at an afternoon coffee or tea. Or how about serving as a dessert at book club? And I do use that vanilla -- I believe the quality is excellent. These are really cute apple hand pie, I like the spice you used. 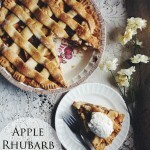 I need to get start baking apple as fall is beginning. I like the idea of sprinkle the turbinado sugar on the top. Gorgeous photos! I'm craving these already and can't wait to try them! These look absolutely marvelous, and I think they fit the fall season perfectly. I can't wait to try them for myself.